Will Guardians of the Galaxy 2 Go Up Against Batman Vs. Superman in May 2016? When Warner Bros. and DC moved Batman Vs. Superman to 2016, they strategically set it to go up against an untitled Marvel movie that had already struck a claim in the May 6 release date. While many speculated that this Phase Three adventure would either be Doctor Strange or Black Panther (both no match for Batman or Superman), a new rumor suggests that Marvel is hitting back hard by setting up a sequel to Guardians of the Galaxy in that time frame. Which speaks to their faith in the upcoming, untested franchise. There is still plenty of speculation regarding Marvel's Phase Three, which will kick off with Ant-Man on July 17, 2015. Captain America 3 and Thor 3 will also be part of the line-up, which ends with The Avengers 3 in 2019. There are also three untitled Marvel movies with set release dates, making for a total of seven movies. Though, Thor and Captain America may ultimately claim two of those dates. But Marvel's Kevin Feige has always held firm that we'd see Doctor Strange as part of this cinematic run. 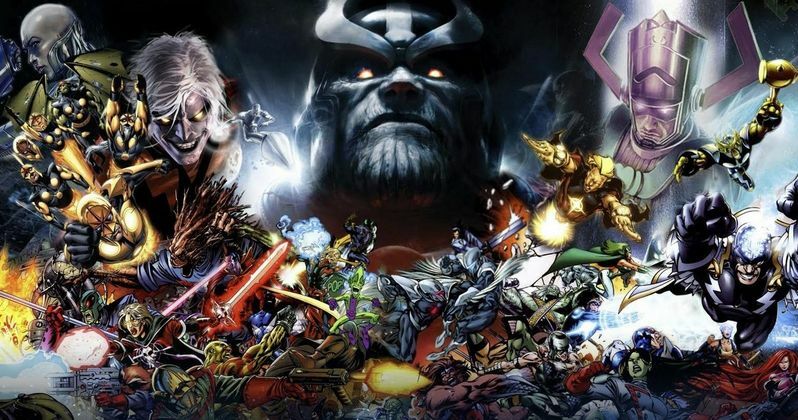 Today, we have an unconfirmed report from JoBlo that puts a sequel to Guardians of the Galaxy in the Untitled Marvel Project 2016 slot that Marvel previously announced will be released on May 6, 2016. This release date is of course subject to change, since Batman Vs. Superman is not a movie to open against. Especially if Guardians of the Galaxy isn't the hit everyone expects. For all anyone knows, it could prove to be Marvel's first major bomb. Fox is also releasing X-Men: Apocalypse on May 27, 2016, so it wouldn't be surprising to see Marvel shift the release date until later that summer. And if it fares poorly at the box office, will Marvel even continue on with a sequel to Guardians of the Galaxy? It seems far too early to speculate on this. JoBlo goes onto confirm a report from last month that Marvel is making a Guardians of the Galaxy animated series for Disney XD. The studio is aiming for a Fall 2015 debut on the network, which would provide a nice segue into the sequel arriving the following year. It isn't known if Guardians of the Galaxy director James Gunn will return for this potential follow-up, although it seems likely that stars Chris Pratt (Star-Lord), Dave Bautista (Drax the Destroyer), Zoe Saldana (Gamora), Bradley Cooper (voice of Rocket Raccoon) and Vin Diesel (voice of Groot) will return.